The Schneider Family Book Awards were given during the Youth Media Awards at ALA Midwinter on January 11, 2016. The Schneider Family Book Awards honor an author or illustrator for a book that embodies an artistic expression of the disability experience for child and adolescent audiences. The award is donated by Dr. Katherine Schneider. Three annual awards are presented for the best Teen, Middle School and Children’s Book. Last year I read several books that were previous Schneider Family Book Award winners, and I really enjoyed them. Once the award winners were announced, I found the middle grade and teen winners in my library system. 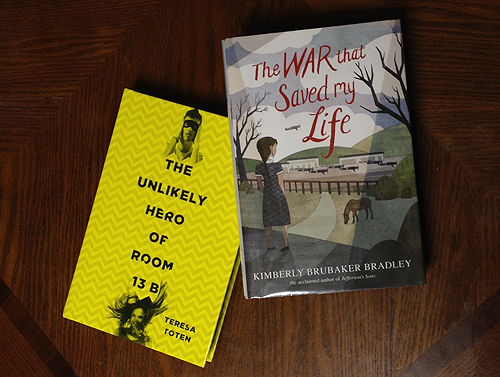 The Unlikely Hero of Room 13B by Teresa Toten is the teen winner. Adam has OCD to the extent that he goes to group therapy. The other teens in the group have trouble opening up and coping, so they all have superhero alteregos to use during the sessions. When Robyn joins the group, Adam is smitten. He’s determined to get better for her, to stop lying, to stop his compulsions, and to start doing the work assigned in therapy. His mother, however, has her own issues that keep Adam’s anxiety high. I’ve never known much about OCD so it was enlightening to read about teens suffering from it, and the different things they do, as well as the different ways to cope. This book was incredibly suspenseful, with Adam's anxiety rising throughout the story, coupled with the mystery of what his mother is going through. The War that Saved My Life by Kimberly Brubaker Bradley is the middle grade winner. Ada was born with a clubfoot, and her mother is ashamed of it. Because of that, Ada has never been out of the house, never learned anything, even though she is... or at least THINKS she is, 10 years old. Her little brother Jamie, on the other hand, is their mother’s favorite, and can play outside and attend school. As the war gets closer to London, plans are made for Jamie to be sent to the country to stay safe. Ada sneaks away with Jamie, and they get on a train with the other children from London. People who live in the country will take in children until World War II is over, but what if no one wants Ada and Jamie? This was a very engrossing book, and I don’t usually enjoy historical fiction. The ending of this book is one of the most satisfying I’ve read in a long time, with a perfect last line. Highly recommended!